It has been a cold weekend here in Melbourne, with plenty of driving rain and the threat of hail to help with the air of general chill and misery. It is the perfect weather for eating warming, comforting food, so I decided to make some dhal makhani. This has always been a favourite of mine, but eating it at restaurants is now pretty much out as it is packed with butter and cream. I always thought that this is what made it so delicious, but really it isn’t. The secret is long slow cooking. I’ll be honest and say I am usually pretty crap at making Indian food. It just never turns out how I want or imagine it should be or it ends up all tasting the same. To try and improve my skills, one of the blogs that I have been following recently is Vaishali’s Holy Cow, a vegan, mostly Indian blog. I spotted a recipe for dhal there that came from another vegetarian Indian website Veg Inspirations. That recipe is for a slow cooker, which I don’t possess, but it also came with instructions for stovetop cooking. I substituted half a cup of split urad dhal for part of the whole dhal. 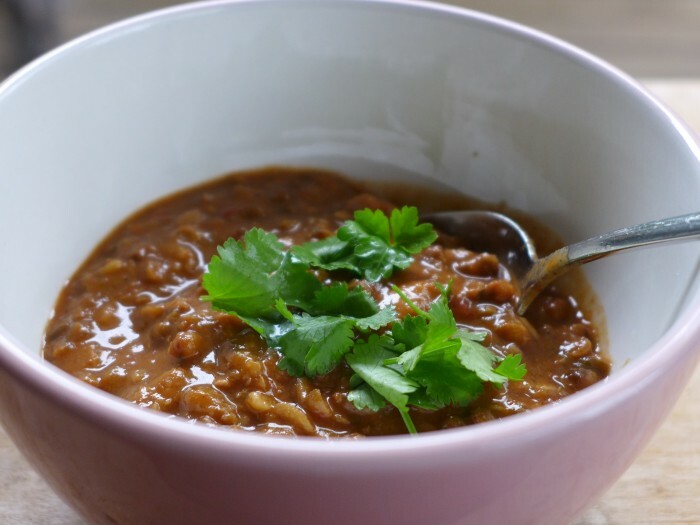 I think the split dhal has made it extra creamy as it cooks more quickly and breaks apart completely in the long cooking time. I cooked it all very slowly for about 5 hours. I added some vegan butter from Half Pint Dairy at serving to give it some extra creaminess. It is utterly delicious, and it tastes authentic. I’d really urge you to make it, I know you won’t be disappointed. The long slow cooking gives it a real creaminess. I honestly can’t tell it doesn’t have cream in it. You could even leave the ‘butter’ out. Soak the beans and lentils in water overnight. Drain the lentils and red kidney beans. In a large saucepan, heat the oil and add the cumin seeds to it. When the cumin seeds splutter, add green chilies and stir for a few seconds. Add the onions and saute them until transparent and soft. Add the ginger and garlic and stir for a few seconds. Add the tomatoes and stir until they become mushy and soft. Add turmeric powder, coriander powder, garam masala and stir for a few seconds. Add the drained lentils and beans, water as required and let the entire mixture simmer together until the lentils and beans have softened and cooked. When I turned vegan 3 years ago Vaishali’s blog – Holy Cow – was my go to resource for all food things Indian. She is amazing! This looks delicious. It is delicious, I’d call it my first really successful Indian food. I’m hoping to make many more!